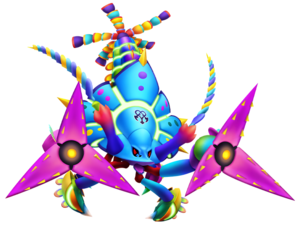 The Chill Clawbster is a Dream Eater that appears in Kingdom Hearts 3D: Dream Drop Distance. The Chill Clawbster is a predominantly cyan, festive-colored lobster with the Nightmare Dream Eater symbol, purple dots and borders on the torso section of its carapace. Parts of its torso section are joined by what looks like white cartilage. It has four cyan limbs; the front limbs end in green and yellow pincers with pink bumps, while the hind limbs end in purple claws in the form of a triangle. These purple claws have yellow spikes, and originate from a black and yellow circular joint. It has a multicolored tail and tentacles. Its eyes are red with black borders. "Kinkin" is Japanese onomatopoeia for freezing. Similarly, the Chill Clawbster is named for its ability to chill, or freeze, its enemies, while "Clawbster" is a portmanteau of "claw" and "lobster". As Sora tries reaching Monstro to free Pinocchio and Jiminy from within the massive beast, the Chill Clawbster attacks, freezing the whale. Realizing the danger it poses to his friends, Sora engages the monster in battle. In the end, the Chill Clawbster is swallowed by Monstro.